Dramatic recreation; as of this point, no photograph of a ninja in the wild exists. Body tilted forward, low to the ground. One forearm crooked in front of the body, apparently to block attacks (two fingers held in front of the mouth optional but prevalent). The other arm behind the back, either crooked or stretched out and high, ready to pull out a bladed weapon (alternatively, both arms can be kept back in this fashion). 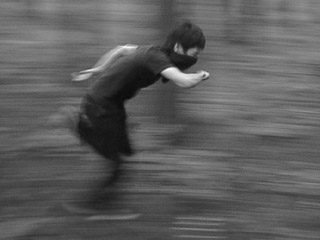 If the ninja carries a blade while running like this, it is always held in a Reverse Grip. The monster Black Ninja from the Yu-Gi-Oh! manga. He even holds his dagger in a reverse grip with the front arm. As Joey (Jonouchi) in the English dub of the anime adaptation puts it, "I love watching this guy run." Cobramaru is seen running like this on occasion in SD Gundam Force. Everybody in Naruto. Or a variation at least, with the torso almost bent horizontally, both arms kept straight behind the back in a V-shape, and open palms bent upward. Check the link to see hundreds of them running like this. In fact, the described stance is the common way of running for people in this show. The trope is occasionally also played straight with one arm in front, usually carrying a kunai. Jiro and most of the other ninja from The Dagger of Kamui. One scene has Jiro and his freshly hired Redshirt Army doing a Power Ninja Run against a rising sun, even drawing their blades in unison. Although the intent is to imply that the character is running normally (that is, swinging both arms back and forth), Rumiko Takahashi's single-panel drawings of characters running almost always ends up like this in her manga, especially in Ranma ½ and InuYasha. In the anime version of Saint Seiya, the Asgardian God Warriors Bud and Syd, twins of the Alcor and Mizar stars, always attack in this manner, preparing their deadly claw attack with the arm kept at the back. Their steps are so short and fast they sound like rain. Occasionally, when Seiya or Ikki start their attacks at a great distance from their foe and need to rush forward, they also initiate the Pegasus Meteor Punch and Phoenix Illusion Fist respectively in this manner. In the third season of Mighty Morphin' Power Rangers, the Shogunzords ran like this before combining into the Shogun Megazord. Unfortunately, since the Shogunzords were pretty bulky and blocky, it looked less like a Ninja Run and more like they were running and checking their watches at the same time. Shinobimaru in Shuriken Sentai Ninninger. This was recently added as a travel power as part of the purchasable "Martial Arts Super Booster Pack" in City of Heroes. It makes an excellent substitute travel power for character concepts that wouldn't exactly be able to leap tall buildings or run at the speed of light. It's even called Ninja Run. Assassins and Rangers are fond of doing this in Shaiya, as they're very much ninja-like in this game. In Lineage 2, this is the Dark Elves' running animation (but females use it without the forearm crooked in front of the body). In Final Fantasy XIV, the Ninja class moves in this manner when their weapons are drawn, both blades held behind them in reverse grip. They also do somersaults when jumping just because. The player character in Jade Empire runs like this when in focus mode. Also, whenever Master Li runs. Mai Shiranui runs exactly in this way in The King of Fighters series, despite not carrying any weapon on her back. This is also Eiji Kisaragi's running animation, again in spite of not holding a weapon while running. Also Gato runs like this in spite of not being a ninja. Yoshimitsu from Tekken can be seen doing this in his victory cinematic from Tekken 5. His former clan member Kunimitsu runs in such a fashion for her appearance in Tekken Tag Tournament 2. Ryu Hayabusa (duh) does this in Ninja Gaiden cutscenes, and in the NES 8-bit games. Elsewhere, he runs like a normal person. Or maybe more like a normal person who is awesome. Ninja chicks (Midori, Mizuki, Luna, Misa) in The Punisher (Capcom) run like this. And they do this in high heels. Both Sheik and Greninja in Super Smash Bros. do this whenever they run. Fitting due to them being ninjas. Shen in League of Legends moves in this manner, complete with the index and middle finger of the front arm outstretched and the other arm behind his back, ready to throw blades. His incredibly slow pace really makes it more of a Ninja Stalk, however. Kotaro in Sengoku Basara runs like this, with one hand on his sword hilt. Sasuke and Kasuga too, although both are holding a weapon in each hand. Also Magoichi, despite not being a ninja. Assassins in Guild Wars do this while under the influence of a speed boost. To their credit, unless they're wielding daggers at the time they will sprint in a more standard fashion; daggers are always dual-wielded and held in a standard grip in both hands, meaning it's actually fairly practical to run like this (one dagger is ready to block attacks, the other one is in a position to use as much of your momentum as possible for a strike). Sol Badguy, Milia Rage and Chip Zanuff in Guilty Gear. Of the three, only the last one is a bona-fide ninja. Sort of. City of Heroes has a power called "Ninja Run" available for purchase. It's a low-level speed and jumping boost, suitable as a replacement for travel powers without outclassing them (particularly for characters who shouldn't have any means to fly, teleport, etc.). When running, the character takes on this pose unless they have two weapons drawn in which case they take on Airplane Arms. In Anarchy Reigns, the ninja character Zero will do this when he gets up to running speed. Valentine from Skullgirls generally moves like this. It has the probably intentional side effect of emphasizing her impressive chest. Espio the Chameleon does this whenever he runs in the Sonic the Hedgehog games due to him being a ninja. Sonic himself does the "Both arms held behind back" variant popularized by Naruto, depending on the game. Guy from the Street Fighter series as part of his moveset. He can follow up with three different moves. In Overwatch, Cyber Ninja Genji runs with his body tilted forward, with one hand in front of him holding his shuriken and one hand behind him holding his wakizashi. Moira runs in the "arms outstretched behind her" variation. Yiga Footsoldiers in The Legend of Zelda: Breath of the Wild run this way when attacking Link with their Sinister Scythes. The ninjas in Epic Rap Battles of History of Bruce Lee versus Clint Eastwood run like this. In Angry Birds Transformers, Soundblaster and both versions of Soundwave run this way in their levels. Nicole from The Amazing World of Gumball runs just like that in the episode "The Choices" when she rushes to her karate tournament. In the DCAU, Batman often runs in a similar manner with both arms concealed beneath his cloak, presumably to quickly draw any weapons or tools and without telegraphing his actions. A modified version of this run is used by modern soldiers to reduce their profile. The soldier runs partially bent or hunched over with head down so that any bullets aimed at his head will strike the helmet, and with his weapon held closely in front of him.